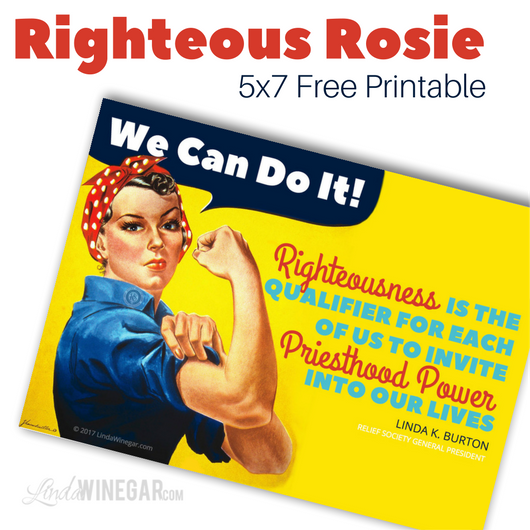 Righteous Rosie the Riveter 5x7 JPG Printable for the sisters you Visit Teach. 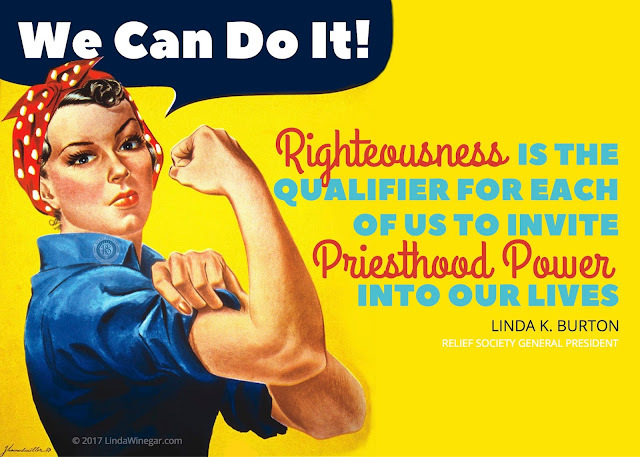 Priesthood Power, how has this amazing power from God to each of us, His daughters, become such a controversial topic for some? Sensitive might be easier for me to understand, but controversial? Satanas, always causing chaos and trouble for us here! Fortunately, I've never struggled with my identity, I've always known I was and still am a daughter of God and I DO have God's power! Maybe it's because I also love Princesses, Fairly Tales, Super Heroes or Super Powers, but mine is real and it comes from Heavenly Father. Most likely it's because it's a gift to know. Like most people, choosing to admit to my divine responsibilities as a teenager may have been a bit harder, but I always knew. Even being "hit" as a child by my father, after my parents got divorced and dad left when I was 16, no longer having a priesthood holder in the home, then suffering from infertility, being barren or childless for 7 years after our marriage, and still struggle with infertility (although we have now been blessed with 2 boys), not once did I ever feel jipped or short changed in any way with regards to the Priesthood. If I ever need more power, I knew what I needed to do, it always depended on me though. Don't get me wrong I've obviously had dark moments in my life (probably too many to count) and details of other times which I've since moved on from, but I've always been grateful to have access to His power, through my baptismal covenants, to have the Holy Ghost as a constant companion, to know if I needed a Priesthood blessing I was only a bike ride away as Missionaries "happen" to pass by when I needed one, now I finally have a worthy Priesthood holder as a hubby who cares for me and our fam too, couple of amazing worthy brothers, other family, neighbors and friends, and I get to live close to Houses of the Lord. As I've attended the temple I've felt of His love for me and that is where I've been able to feel real Priesthood Power and protection. When I think of Priesthood Power, I've personally come to know it is something us women tap into on a daily basis, or more accurately have access to. Depends on our desires and actions if we actually do tap into it everyday. We can pray, we can read, we can ponder, we can study, we can listen, we can love, we can fast, we can serve, we can do ANYTHING to tap into that Priesthood Power! That is why Rosie the Riveter came to mind when I read this month's Visiting Teaching message, because WE CAN DO IT! Sure it takes time, and you have to make time, but we CAN tap into Priesthood Power! When I feel distant from Heaven's help, I have to remind myself. We have access to Priesthood Power, just like we have access to running water, but our choices determine if we can get to it or not or even how much of it we do get. Do you open the faucet for a quick trickle? Do you keep the faucet open for long periods of time? Do you like to have a constant flow at all times and in all places? Does your faucet need a plumber's help to get it opened because it's stuck? Rosie's got ya covered, she knows how to work! Faucets don't open, close or regulate on their own, ok, well the one in our tub is defective so we aren't talking about that one, LOL but that's a whole other story. We must work at tapping into that Priesthood Power, we already have access to it, we just need to learn how to keep the flow going. I need to fight to keep that flow going because things can clog the pipes sometimes. Got a clogged pipe? Something that helps with that, is the Temple! So much power comes from temple attendance! “If we will humbly present ourselves before the Lord and ask Him to teach us, He will show us how to increase our access to His power,” said President Russell M. Nelson, President of the Quorum of the Twelve Apostles. May Rosie remind us to tap into that Priesthood Power we all have access to, so we can feel loved and bless the lives of those around us. Click on the image and save it to your phone or computer and send to your fave printer if you desire and throw it on your fridge or journal.